Farfars Fabrik (Grandfather’s Factory) is a recent Swedish short film produced by Anders Fällman and Eric Väpnargård. Set in the 1980s, the film centres on a child – Ester – and her grandmother (Marian). Ester’s grandfather, an inventor, dies suddenly and it is discovered by Marian that he has been involved in some secret research project she knew nothing about. Ester, it turns out, knew about her grandfather’s his secret work. The top secret project was trying to build a machine that could make everyone live forever. But, in being so heavily involved in this project, he was more-or-less absent from those around him who loved him. As the film unfolds, we learn of a mysterious book, titled “Grandfather’s Factory”, and in this book the events and illustrations appear to be mirroring the plot of the film. Questions are raised on what is fiction and what is reality. 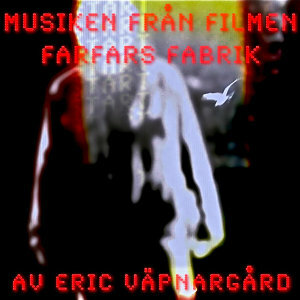 Farfars Fabrik’s music is written by Eric Väpnargård. Väpnargård’s “day job” is as a full time high school music teacher who enjoys composing music for various projects including plays, documentaries and short films, as well as writing synth arrangements for a variety of bands. His interests include being a keen collector of old synths and drum machines from the 1970s and 1980s. It is these old analogue/early digital instruments and drum machines that form the backbone of the music composed for Farfars Fabrik. Harking back to the synth scores of John Carpenter and Tangerine Dream (amongst others), Väpnargård’s music is extremely listenable, and offering track after track of 70s/80s-influenced electronica: a style that ties in with the era in which the film is set and also gives a nod to the feeling at the time the film is set, that computers were the solution to the world’s problems. “Farfars Fabrik” opens the score with a grand, almost portentous, statement of a theme that appears throughout the score. An ominous strings-like synth pad leads into this grand statement on synths that has a distinctly organ-like tone. Together, the overall effect is not dissimilar to the finale of Jack Nitzsche’s score Starman, thought the setting of Väpnargård’s theme here is a little bit more downbeat, and slightly sad in tone. A jazzy saxophone line meanders in the background late on in the track. There is a reverb quality to the sound of the saxophone that gives it a dream-like, almost forgotten feel. This theme and the use of saxophone appear in a number of guises during the course of the album, with the saxophone occasionally taking up the thematic material. The echoing saxophone from the opening track is heard again in both “Patent & Komponent” and “Fåglar Vid Horisonten”, but a stronger and more prominent statement of the theme on saxophone (played by music teacher/saxophonist Fredrik Myrén) is featured on one of the highlights of the score, the excellent “Himmel Över Bjurtjärn”. John Carpenter/Tangerine Dream-styled synth patterns are laid down alongside drum machine percussion to set the scene for a powerful rendition of Väpnargård’s theme. Then Myrén heads off on a sequence on the saxophone that has an improvised quality to it, before coming back for a final statement of the theme. As with many tracks on this album, “Himmel Över Bjurtjärn” makes a great self-contained, stand-alone listen. The use of a live saxophone is a welcomed appearance on this synth-heavy score as it provides an excellent complement – as well as a bit of tonal variety – to the various electronics. The saxophone and a twangy electric guitar combine in “Ettor & Nollor” to add another variation of the theme and, to close the score, “Gestalter i Ljuset” features a final statement of the main theme which seems a little bit subdued. Finally, a particularly effective version of the opening theme can be heard late on in the album in “Ester”, where Väpnargård uses a synth tone that’s very much reminiscent of a child’s plastic toy piano. Played solo, this version gives the theme a delicate feel and suggests that this theme has belonged to the young girl all along and that she’s central to the film’s plot. This main theme is a significant part of the score but another aspect of Farfars Fabrik that is very distinctive is the choice of very bold synth tones and rhythmic patterns. First set out in the already-mentioned “Himmel Över Bjurtjärn”, another fine example of these synth patterns is heard in “Patent & Komponent”. A catchy bass synth rhythm is established early in the cue and this is then overlaid by a secondary – and complimentary – rhythm pattern, a choral synth pad and slow drum machine patterns. Once the combined elements are allowed to sit, centre-stage for a moment, each element then disappears – layer-by-layer – to leave the original bass rhythm before the track ends. Pure eighties drum machine is another feature of the score that recurs. For example, there’s Jan Hammer/Miami Vice style drums to supplement the bright synth chords and bass synth patterns heard in “Saab Sonett”, and “Tid” features a drum/cymbal pattern reminiscent of a similar motif I hear in Jean-Michel Jarre’s live album, Souvenirs of China. Memories of Jarre’s music are stimulated several times in the score – probably because of the use of similar synths by both Väpnargård and Jarre: a synth pattern heard in “Åter Från Döden” reminds me of Jarre’s fantastic second album, Equinoxe. Farfars Fabrik is littered with many reminders of synth music of the 1970s and 1980s, sometimes even earlier. One of the most unusual is heard in “Fåglar Vid Horisonten”. The opening of this track reminds me of the bass rhythm patterns from the sickbay scanner in the 1960s TV show, Star Trek, before the bass synths here morph into a synth version of the bass guitar ostinato of Ennio Morricone’s “Humanity, Part 2” from John Carpenter’s The Thing. I find “Fåglar Vid Horisonten” particularly interesting because it’s the track on the album that feels most like a film cue. The majority of the other tracks on Farfars Fabrik play like tracks on a pop or rock synth album: each track is a self-contained musical idea which has a clear beginning, middle and end. Although “Fåglar Vid Horisonten” also has a clear start and finish, the cue seems to develop and change. As already mentioned, the cue opens with the “sickbay scanner” motif and to this is added the echoing saxophone (playing the “jazzy improv” variation of the main theme). The saxophone then ebbs away only to return later with an accompanying metronome/ticking clock motif. Within all of this there are isolated bass synth tones scattered about. Together, it all feels like the music is supporting actual on-screen happenings rather than just providing an overall feel to a scene without really following the action. To complete the variety of musical ideas used in the score, a couple of tracks are less thematically based and more ambient in nature, featuring washes of ominous synths or general chord progressions rather than propulsive rhythms or thematic material. Farfars Fabrik is a very memorable album on two fronts. Firstly, there’s an excellent main theme. It’s very melodic and it is played to great effect by a number of parts of the musical landscape that Väpnargård has created, particularly on the saxophone. The second aspect of the score that stays in the mind is the composer’s use of old analogue/early digital synths and drum machines. The tones these machines throw out are wonderfully warm and welcoming rather than the harsh and abrasive sounds some modern synth-based scores can create. And with these early synths, memories back to the early pioneers of synth scoring in films (and synth music generally) are triggered so that, listening to this album, it’s like becoming reacquainted with an old friend. It’s been difficult finding much information on the film but it does seem that the film runs to about 30 minutes. This album runs to over forty, suggesting that my assumption that many of the tracks were written as complete pieces that were later edited down to fit the image, may be correct. Having such complete pieces on the album adds to the listening experience, meaning that much of Farfars Fabrik can be enjoyed purely as an example of an early synth album. Eric Väpnargård’s album is heartily recommended and, more widely, the composer’s endeavour to try and preserve these old synths (sometimes having to repair them) is to be applauded. Farfars Fabrik is available to stream on Spotify and can be bought at many of the usual online stores as a digital purchase. Audio clips can be listened to HERE.